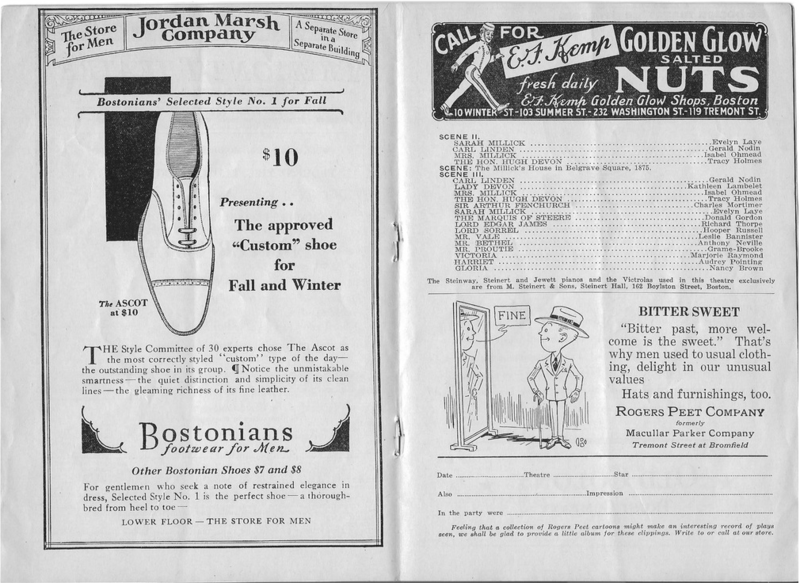 The Era 9 October, 1929. A Company 130 strong headed by Evelvn Laye, embarked on the "Mauretania" and the “ Lancastria,” which sailed from Southampton on Saturdav. 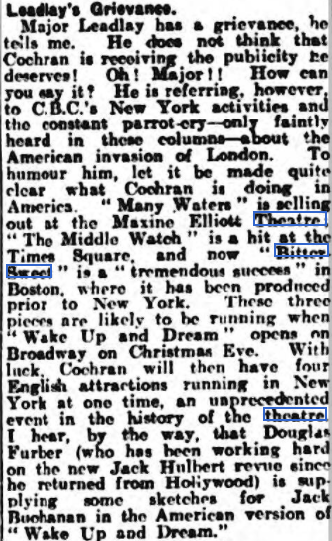 They open in Noel Coward's Bitter Sweet at the Ziegfeld Theatre, New York, at the end October, under the management Charles B. Cochran and Archibald Selwyn, after playing a week in Boston. 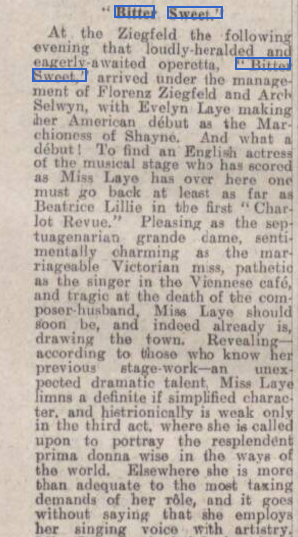 Others accompanying Miss Laye are Alexandro Rosato, Mireille, Captain Cecil Ramage M.C., Charles Mortimer, and Gerald Nodin. 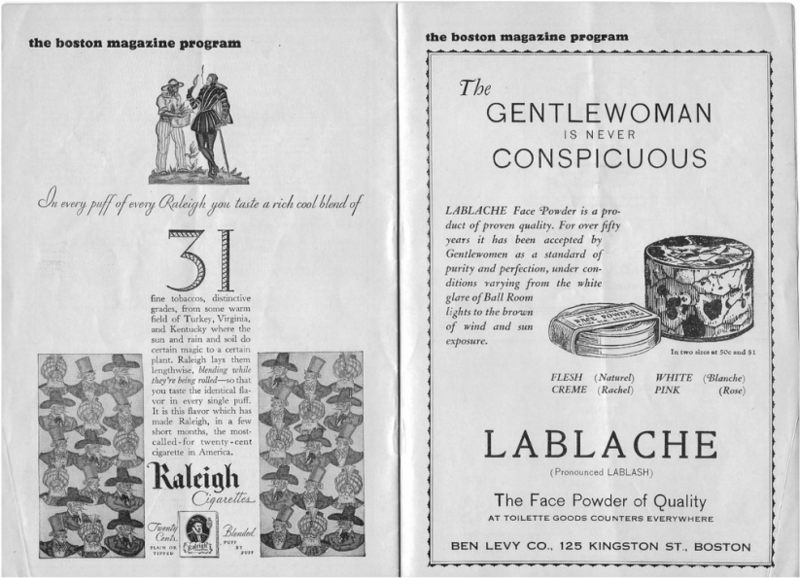 The Era 5 March, 1930. Bitter Sweet is nearing its 300th performance at His Majesty's Theatre, and "C.B.C.” tells me that the demand for seats at the box-office and the enthusiasm of the audiences are just as much they were the beginning of the run. 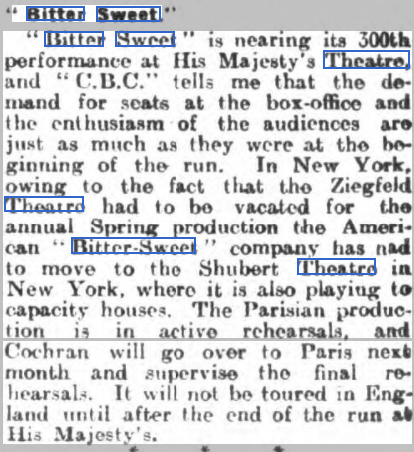 In New York, owing to the fact that the Ziegfeld Theatre had vacated for the annual Spring production the American Bitter Sweet company has to move to the Shubert Theatre, New York, where it is also playing to capacity houses. 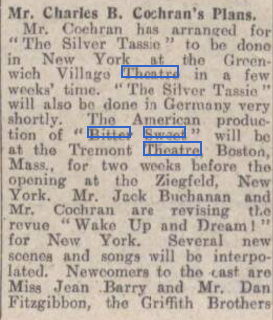 The Parisian production is in active rehearsals, and Cochran will go over Paris next mouth and supervise the final rehearsals. It will not be toured in England until after the end of the run at His Majesty’s. 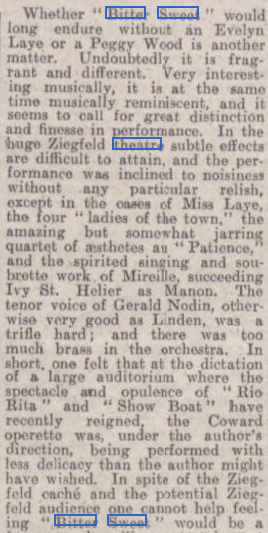 From The Stage - Thursday 21 November 1929. 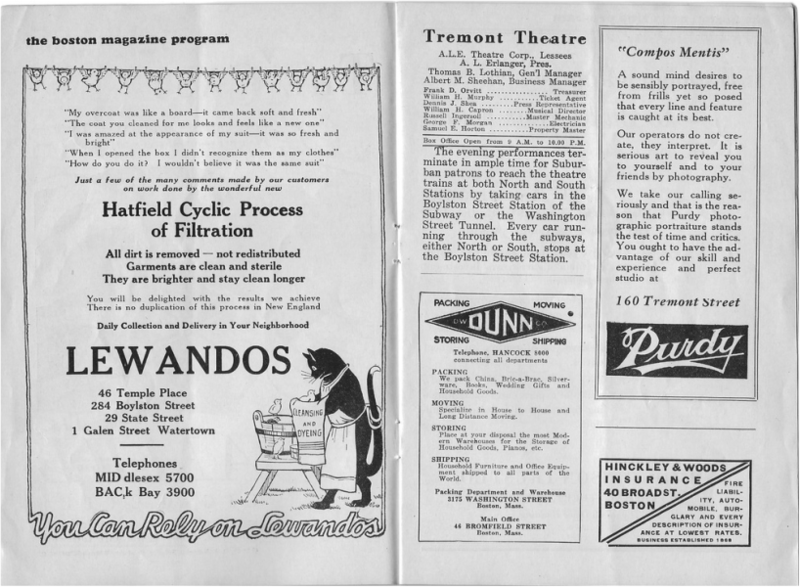 From The Era - Wednesday 05 March 1930. 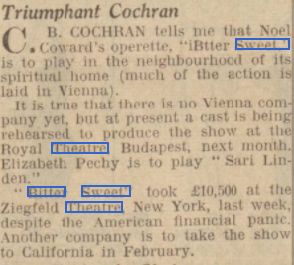 From The Sketch - Wednesday 08 January 1930. 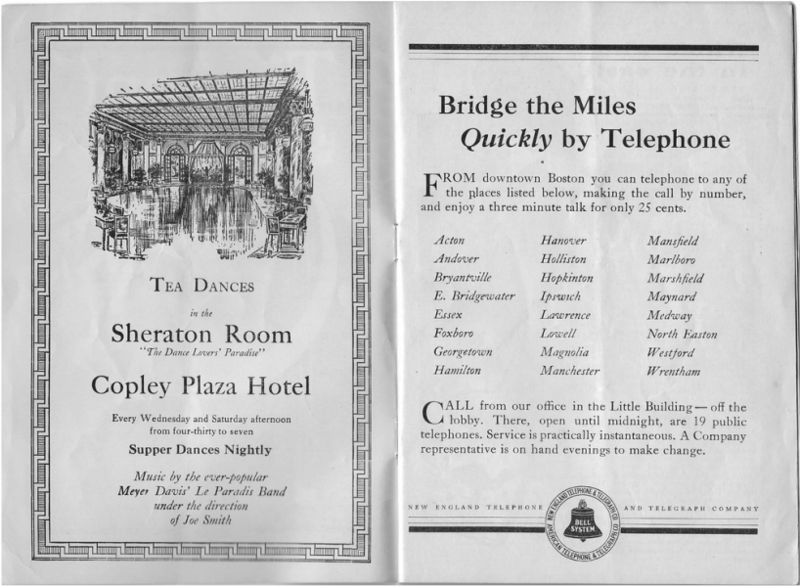 From The Stage - Thursday 17 October 1929. 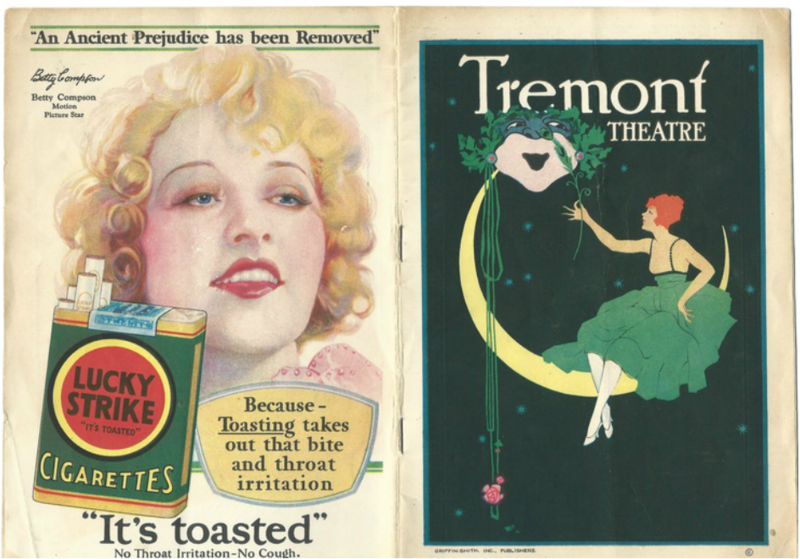 From The Era - Wednesday 30 October 1929. From The Derby Daily Telegraph - Wednesday 20 November 1929. 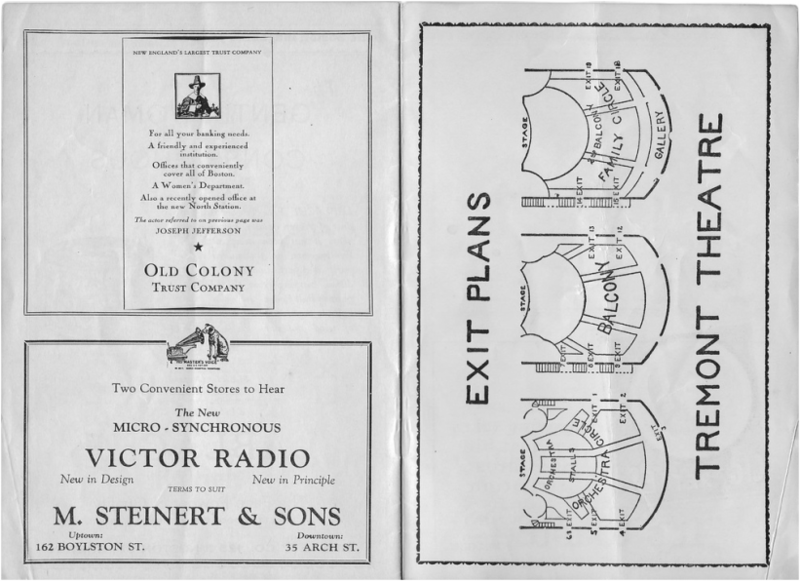 From The Stage - Thursday 14 November 1929. 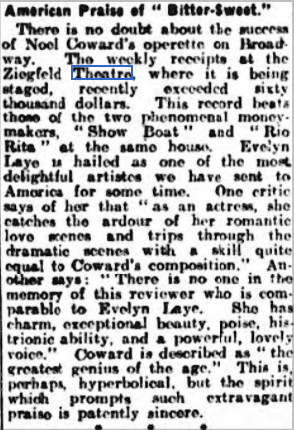 From The Era - Wednesday 27 November 1929. .... and at the Ziegfeld Theatre, New York, U.S.A, in 1929. 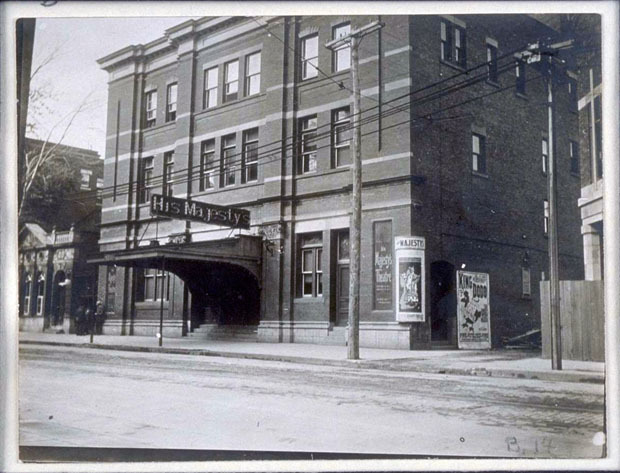 .... and at His Majesty's Theatre, Montreal. 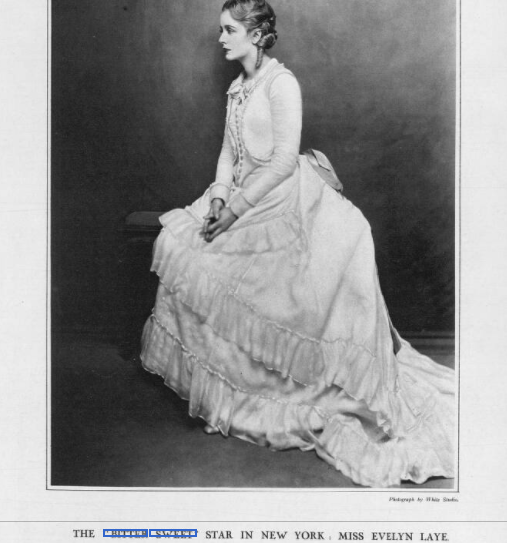 Charles also wrote letters to Greta from Philadelphia and Detroit, it is, therefore, likely that the play also came to those cities. 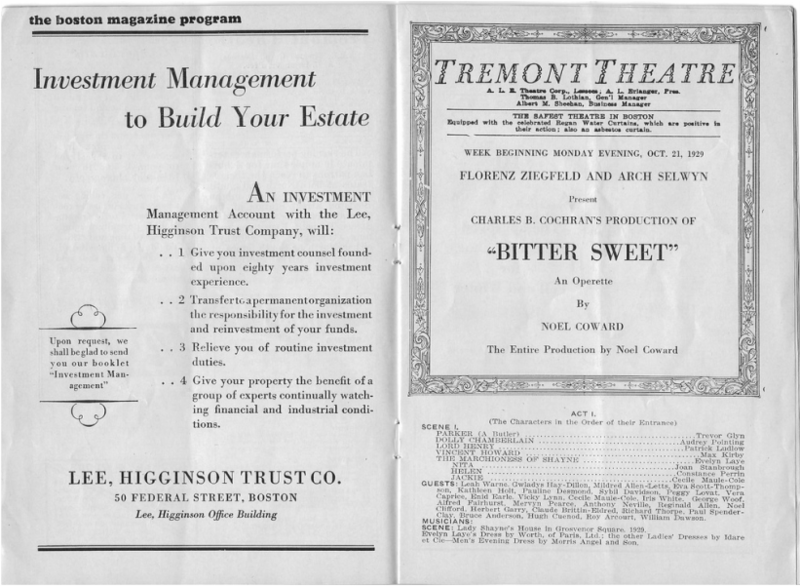 "BITTER SWEET" was at the Tremont Theatre in Boston, Massachusetts, in October, 1929. 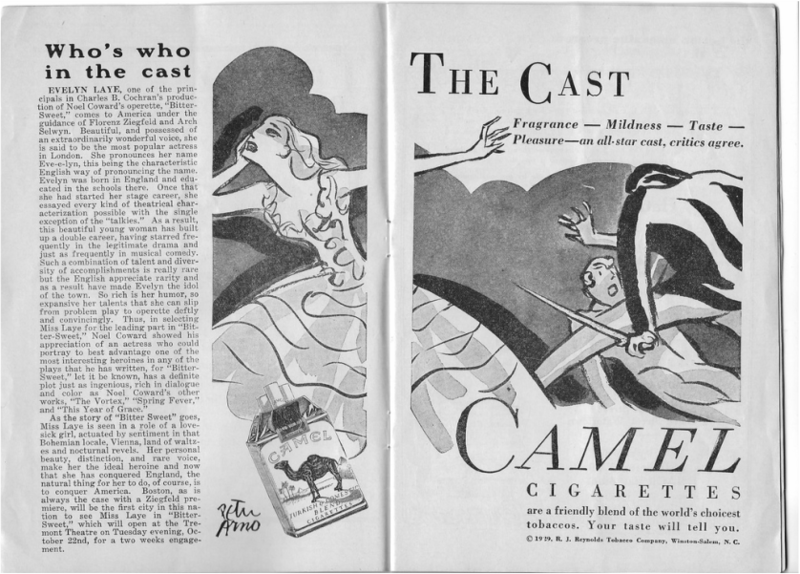 (The production would open November 5th, 1929 at the Ziegfeld Theatre in New York City and run for 159 performances.) ..... 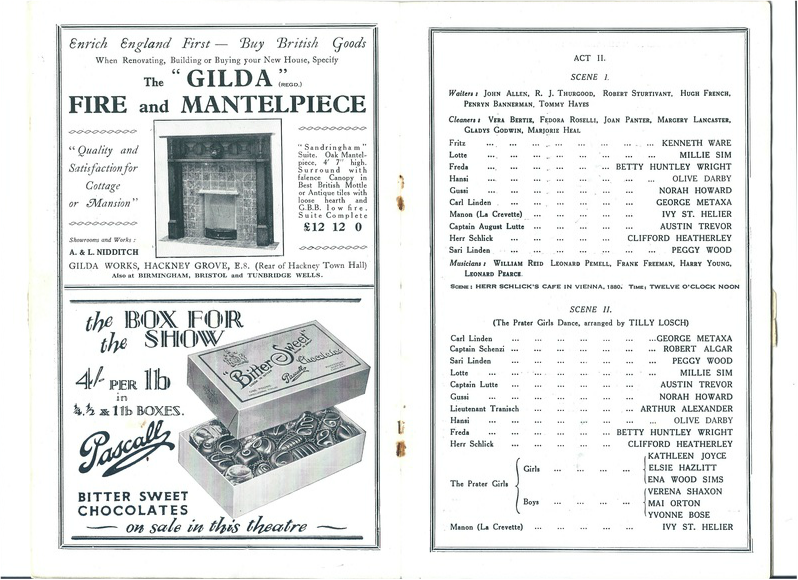 The musical starred Evelyn Laye, Mireille and Gerald Nodin and featured Trevor Glyn, Audrey Pointing, Patrick Ludlow, Max Kirby, Joan Stanbrough, Constance Perrin, Cecile Maule-Cole, Isabel Ohmead, Tracy Holmes, Kathleen Lambelet, Charles Mortimer, Donald Gordon, Richard Thorpe, Hooper Russell, Leslie Bannister, Anthony Neville, Douglas Grame-Brooke, Marjorie Raymond, Nancy Brown, Isla Bevan, Winifred Talbot, Vest Sylva, Peter Donald, Zoe Gordon, Nancy Barnett, Dorothy Debenham, Sylvia Leslie, Desmond Jeans, Louis Miller, Albert Chapman, John Evelyn, Jane Moore, Paul Spender-Clay, Hugh Cuenod, George Woof and Eddie Lisbona. 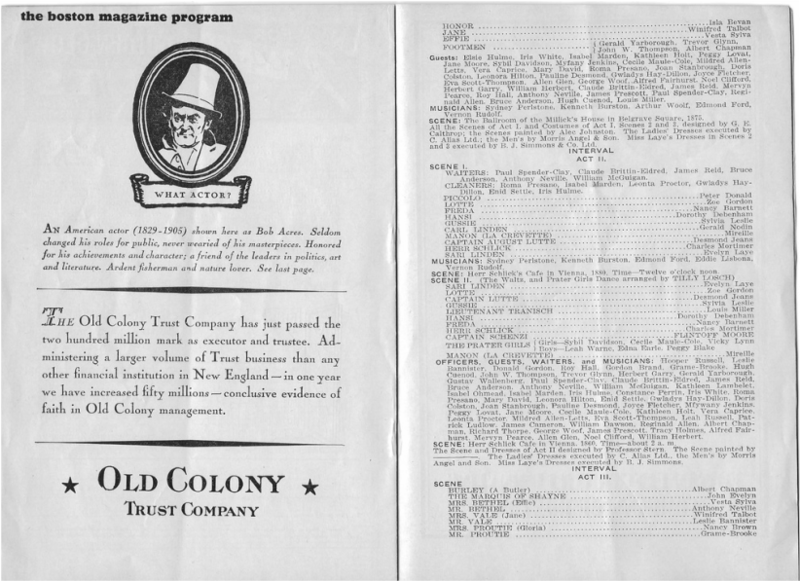 The musical would open on Broadway one week after "Black Tuesday" (October 29th, 1929), which is known as the worst day in stock market history and the start of the Great Depression. 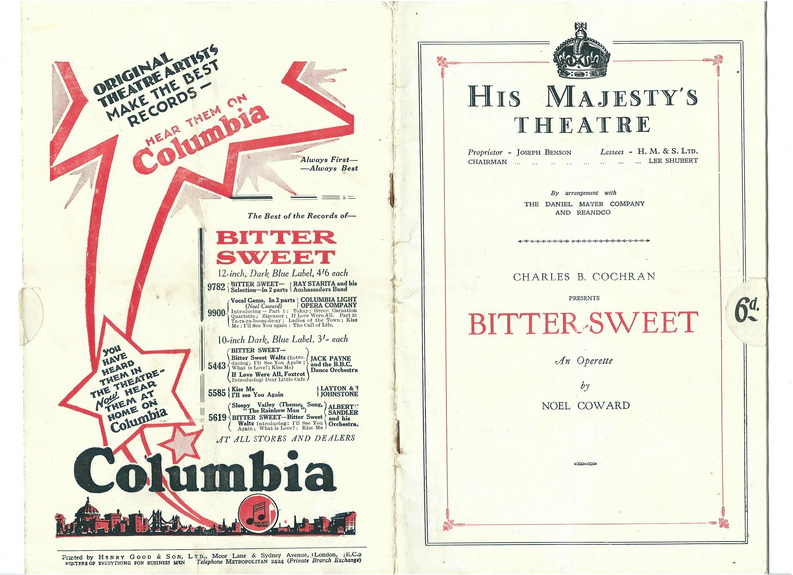 NOEL COWARD however thrived during this period, writing a succession of popular hits ranging from large-scale spectaculars to intimate comedies. 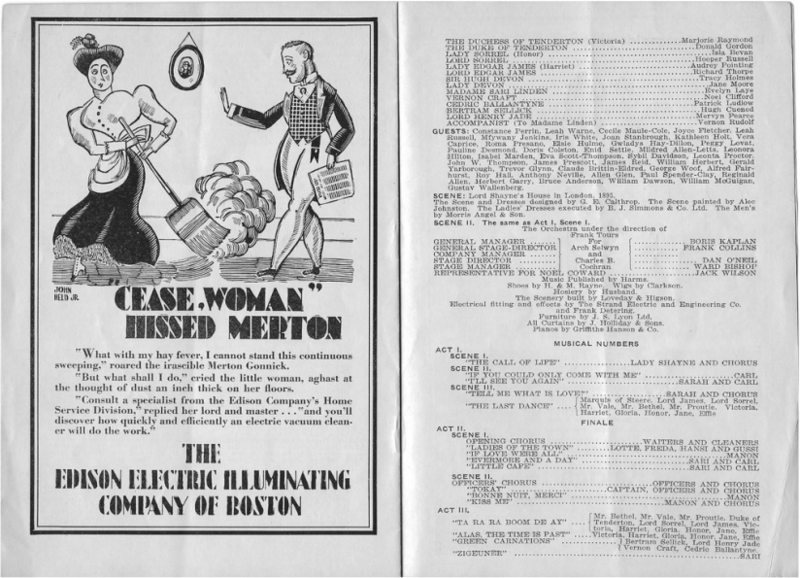 This programme was from the London season of the play, prior to its visit to North America. The cast did not include Charles Mortimer.